When architect Michael Murphy came home to San Francisco after a decade in London, his fresh eyes gave him a new appreciation for the city’s architecture — especially the modern buildings that often get overshadowed by the showier Victorians. So he began creating a series of prints celebrating some of his personal favorites, including several in the neighborhood. 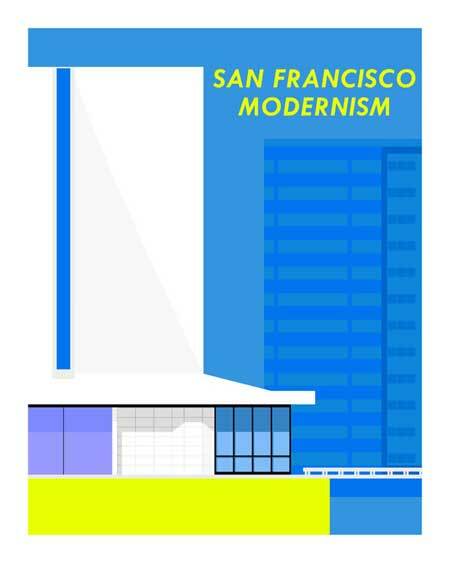 There’s the new St. Mary’s Cathedral (“one of the most beautiful spaces in San Francisco,” he says) and the Japantown pagoda (“simple, with cherry blossom pink”), modern Pacific Heights (“it’s cocktail time”) and even daytime and nighttime tributes to the much-maligned Jack Tar Hotel on Van Ness Avenue. The entire series is available at Zinc Details, the emporium of modern design at 1905 Fillmore Street, and on Murphy’s website.